Increased the number of cases from 5 (0..4) to 20 (0..19). Almost all conditionals have fewer than 20 cases. Switched ternary style based on a comment by whitered. This was very helpful as the nesting got deeper. 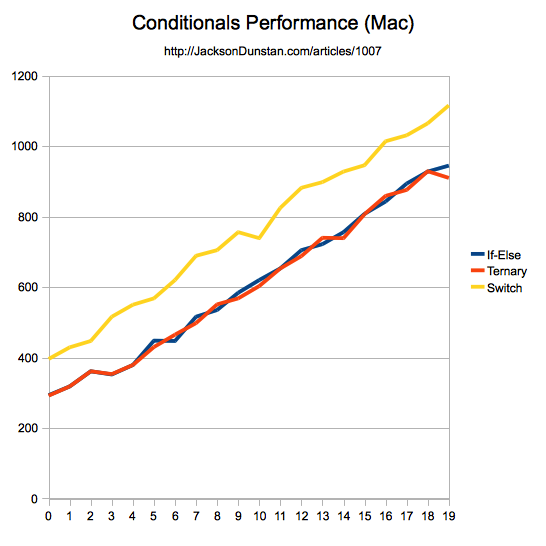 As you can see, the performance of all three conditionals scales linearly. This means that if-else and the ternary operator continue to outperform switch statements by 10-15% on both platforms regardless of how many cases there are or which case is actually matched. This is quite disappointing for switch as it should beat its competition with larger numbers of cases, but sadly it is always the loser for reasons described in the previous article. 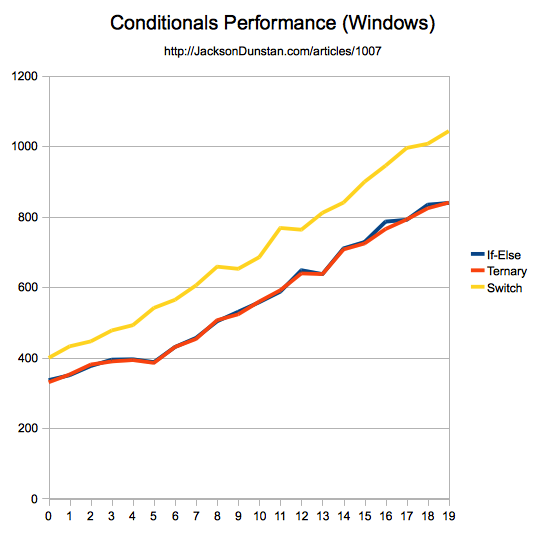 Bottom line: beware of switch statements in performance-critical code! You should compare with different statement structuring, such as a tree instead of a linear list. Also, just for fun, compare how a lookup Vector with Function objects do. It would have faster access than if statements, particularly at deeper levels. However, the function objects would massively slow it down, to the point of being ridiculous. Of course the speed is gain only for values that are consecutives and ints. Looks like a nice alternative! It’s a shame that switch is so badly implemented that it’s necessary to do this sort of thing. Perhaps a future version of the compiler will improve the bytecode generation for switch. I don’t believe anyone at Adobe works on the compiler anymore, so it’s doubtful that this will happen before AS4 and the need for a new compiler. Alternatives are as good as you can get for now, unfortunately. The performance is a flat line, the way you would expect switch to work! You can see the other approaches scale up linearly as they are O(n), but the TableSwitch never takes more time as it is O(1). By the end of the 20-case chain, TableSwitch is 3x faster than regular switch! Thanks for posting your results! I can only hope that this optimization makes its way into a future MXMLC, or perhaps a helper tool like Apparat. It’s certainly faster for int/uint; However, there are still Objects that can be used, for which the pseudo-code I posted below would work best; By eliminating the overhead of the useless (at that point) lookupswitch statement. Adobe was headed in the right direction, but messed it up, which is too bad. Also, a sidenote for Jackson: your reply comment box is fixed-width: you should change it to be a percentage, as replying gets irritating when 60% of the box is hidden from view. Definitely. This is the reason that switch only supports constant integers (int, char, etc.) in languages like C/C++ and Java. What the compiler really should output is something like your version (like an if-else chain) if the values are not constant integers and something like pleclech’s version if they are constant integers. Instead, they essentially output both, which is a total waste as shown by the 10-15% speed hit in the article. Going further than this: omit the lookupswitch statement altogether. That should actually bring switch statements into the range of if statements, and still keep the break/no break functionality. Thanks for sharing this. Got same results on my tests! Hi, maybe too late, but want ask about “nested ifs”. Used const ITERATIONS:int = 5000000; coz i have old laptop. It’s an intriguing idea that was also mentioned in the comments for another article. I plan on doing a full test very soon. Thanks for the tip and the preliminary performance results!